Photo: Children enrolled in our ‘Children’s Hope Center’ in the slums of Manila enjoy fresh-cooked meals, reading workshops, and homework tutoring. 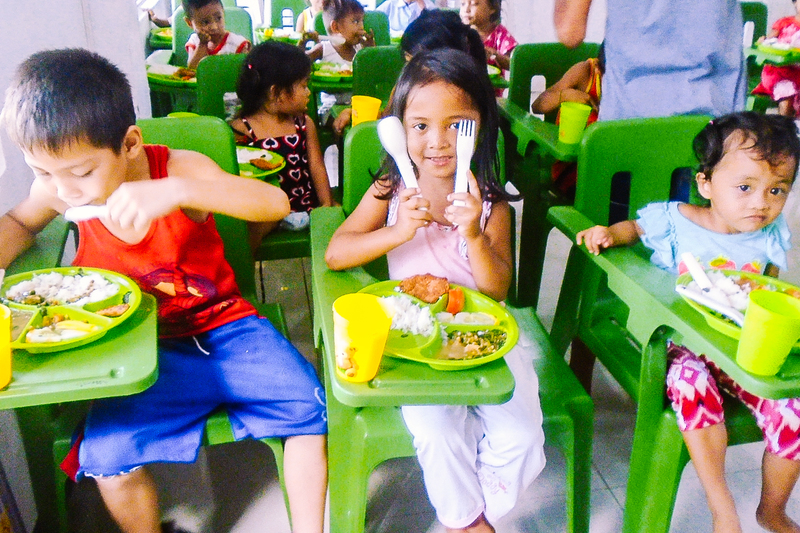 We are happy to report that we currently have 100 children (30 children ages 4-6; 50 children ages 7-10; and 20 children ages 12-17) enrolled in our Children’s Hope Center after-school care program in the Payatas Landfill Colony of Manila, Philippines. The children started back to school on June 5th where they are studying math, English, their native Filipino language, science, social studies, technology, and skill development in grades 1-6, and algebra, geometry, English, the Filipino language, biology, chemistry, physics, social studies, technology, and skill development in junior high. All of the children receive homework tutoring for these subjects from our 9 faithful volunteers at the Hope Center every Saturday from 8:00-10:00 am for children 4-6 years old, 10:00 am-noon for children 7-10 years old, 1:00-3:00 pm for children 11-17 years old, and on Sundays in a morning and afternoon session. We are hoping to find 5 more volunteers so that we can also offer homework tutoring for the children during the week as we were doing in the previous school year. We have had some challenges retaining enough weekday volunteers to run the center on a full schedule. We are also focusing on the problem of illiteracy amongst impoverished children — this is an important part of our weekly after-school care program which has proven so successful in our other Children’s Hope Centers. The children can also work on the computers, and get snacks and a fresh-cooked meal before going home for the day. In order to keep our Hope Center programs running smoothly, enabling the volunteers to care for our children well, we are seeking to raise $200 in new monthly donations. In addition, we want to enhance the children’s talents in arts and crafts and teach them to play guitar and drums. Thus we also hope to acquire materials for crafts projects, and guitars and drums for the children’s lessons. With your generous support we are also hoping to raise money to expand the Hope Center building so that we can launch a skill development program to help the families of the enrolled children find safer and more sustainable work than trash scavenging. The parents of our students only earn $1-2 per day, and their children are often involved in child labor to help provide money for their families as well. When we launch the skill development program, the parents will learn seamstress and tailoring skills making pajamas, shorts, and dresses, and also learn how to make homemade dishwashing liquid which they will be able to sell for additional income — the thought being that the more we can equip the parents for higher income earning potential, the less likely they will be tempted to engage their children in hazardous child labor. To begin this new program we are seeking support to purchase sewing machines, fabric, thread, and supplies to produce homemade dishwashing liquid. 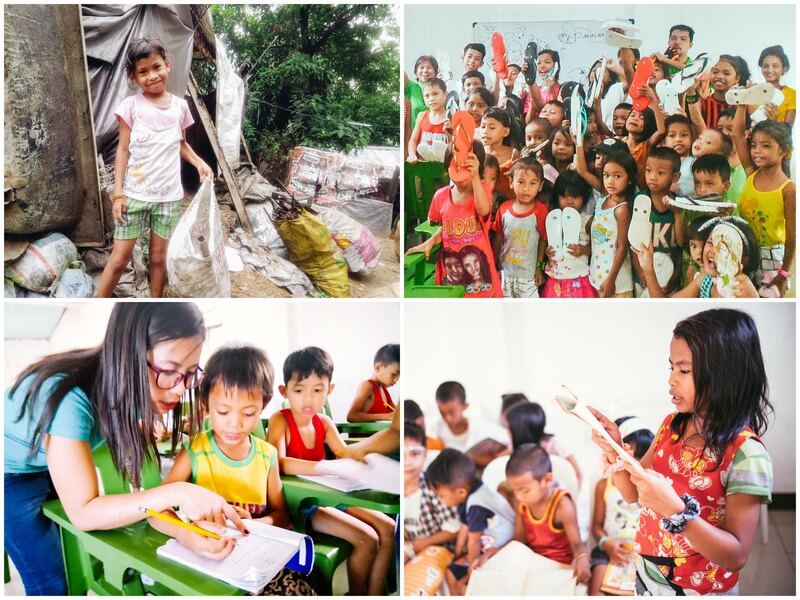 Photo inset: (Top-left): Our Manila Hope Center is planning to launch a skill development program to help the families of the enrolled children find safer and more sustainable work than trash scavenging. (Top-right): Our team presented new sandals to children enrolled at the Hope Center after finding out they did not have the means to buy their own. (Bottom-left): A volunteer teacher provides tutoring to a boy at our Hope Center. (Bottom-right): An important part of our Hope Center program is focusing on the problem of illiteracy by offering reading workshops. We also have a dream to open a ‘She Has Hope’ rehabilitation home in the to-be-expanded Manila Hope Center space. The home will be modeled after our first ‘She Has Hope’ home in Kathmandu, Nepal, which restores survivors of human trafficking. Just like in Nepal, the girls in Manila will receive counseling and medical care, and room & board in a safe and peaceful environment. The girls will also be enrolled in a skills development program where they will become proficient in several craft-making, seamstress, cooking, and gardening skills, and receive support in basic literacy. Through their craft-making and seamstress work, we plan to teach the girls in Manila how to make beautiful jewelry items, such as necklaces, bracelets, and earrings made from indigenous materials. The girls’ handmade crafts will eventually be sold online at SheHasHope.org, all proceeds directly supporting their rehabilitation. In other good news, and thanks to your generous support, we were recently able to give 60 of our children new sandals. Our kind-hearted field director found out that many of our children do not wear sandals or shoes — not because they choose not to wear them, but because they do not have the means to buy sandals. Our field director budgeted the money from your generous donations along with some contributions from family and friends in her local church. Our team presented the new sandals to the children after one of their tutoring sessions and fed them a special treat of sweet porridge prepared by some of our volunteers. The children were very happy and grateful for the blessing of new sandals, keeping their feet safe and clean in the hazardous conditions of the Payatas Landfill Colony. We are continually grateful for your prayers and faithful support which makes all that we do for these children possible.